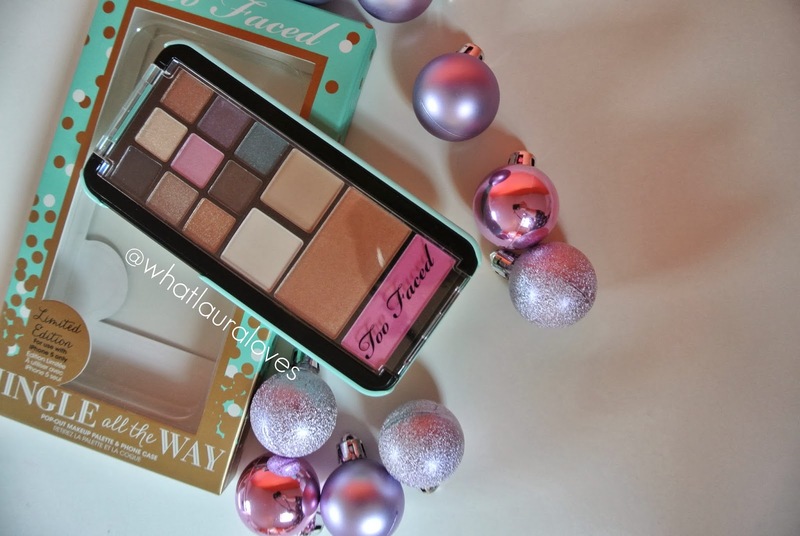 When I included the Too Faced Jingle All The Way Palette in my Girls Christmas Gift Guide this year, I couldn’t wait to photograph it so that I could actually use it and now that I have, I cannot wait to review it. I’ve used Too Faced make up for about ten years now and can honestly say that I have never been disappointed in their products and I feel the same way about this palette- it’s brilliant. The Jingle All The Way Palette is an exclusive Christmas gift from Too Faced. It features a make up palette with a limited edition iPhone 5 case on the back that you pop off and pop on your phone. I’m upgrading to the iPhone 5 at the beginning of next year so I’m looking forward to being able to use the case. The case actually has an exclusive pattern that’s designed by celebrity decorator Mary Macdonald. It is a gorgeous mint green colour with white and metallic gold spots all over it- I love it! Now onto the make up itself. The case is slim and streamlined making it perfect for travelling or for popping into your hand bag for touch ups on the go. The palette contains 11 powder eye shadows in a selection of colours that work really well together. There’s some neutrals in there, a pink, purple, green and midnight blue, real jewel tones that are perfect for the party season and nine of them have a shimmery finish. 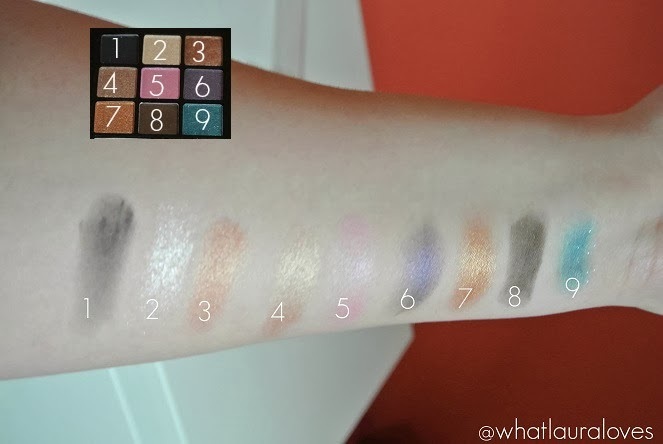 What I love about the eyeshadows is that you receive too larger matte shades that work perfectly as a highlighter on the brow bone and inner corner and as a base shade to mattify and neutralise the colour of the eyelid before adding the shimmery shades. As expected from Too Faced, the pigmentation is spot on, the shadows blend easily and feel buttery soft. Also included in the palette is a bronzer and a blush which are, again, ridiculously pigmented. The bronzer provides a gorgeous sun kissed glow to the face. This is definitely a powder you would use to give a healthy, tanned look to the face, not a shade that you would use to contour with as it is slightly shimmery and it isn’t muddy in colour. The blush is a gorgeous bright pink with a blue undertone. 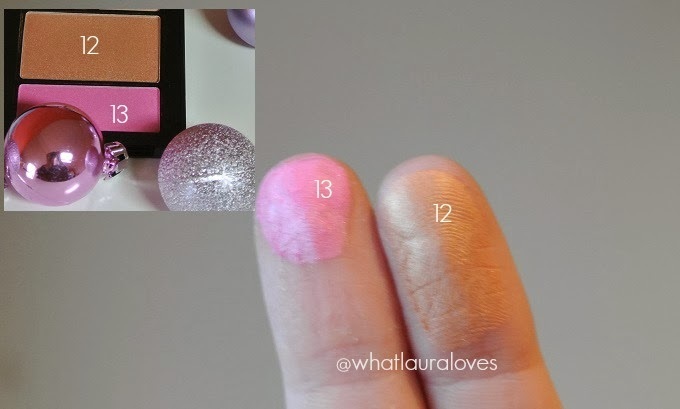 I love wearing pink blusher during the winter as it gives a lovely pink flush of colour to the cheeks. This one is girlie and feminine and looks so pretty particularly when worn with a pink lip and lashings of mascara.